Newly elected MN Muslim Congresswoman, Ilhan Omar, married her brother so he could get into the country. Now Congress is about to allow her to wear her Hijab in the House of Rep.
Omar reportedly married Ahmed Hirsi, the father of her three children, in 2002, according to Power Line. However, that wasn’t her last marriage, as she allegedly married again in 2009, but this time to her own brother — Ahmen Nur Said Elmi. 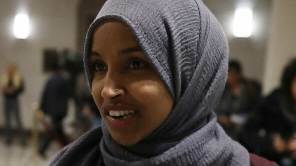 The reports suggested that the marriage between Omar and her brother, a British citizen, was to assist his entry into the United States. US House Reverses 181-Year-Old-Rule To Appease Newly Elected MuslimFor 181 years, you haven’t been able to wear head coverings on the floor of the House of Representatives. Now, however, after the election of the first ijab-wearing Muslim representative, that’s about to be changed. He did say he doesn’t think one will happen because “Democrats will come to their senses” on the issue.And he said he’s ready to keep the troops he deployed to the border as long as necessary. null and avoid within their jurisdictions — period. privileged because of the color of their skin. If I am tired of these Americans being used as scapegoats to further the agenda of race mongers, then it is a sure bet that those being unjustly vilified are especially weary of same. It isn’t just the issue of immigration that is changing the demographics. The rate at which white Americans are giving birth is declining.